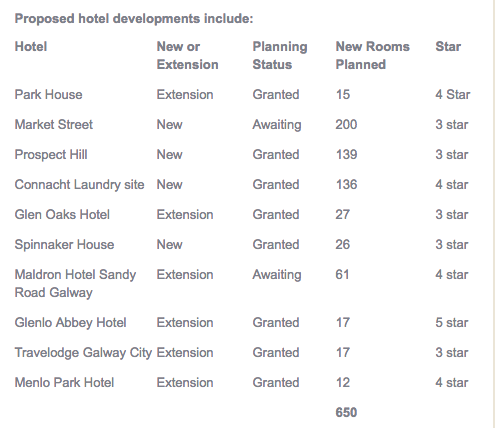 Hoteliers and developers are planning 600 new bedrooms for delivery in Galway from 2020, according to Savills Ireland. In a new study the property firm highlighted that strong hotel trade is encouraging this developer activity. Savills said that according to Trending.ie, Galway hotel occupancy was over 74% last year, up from 69% in 2013. Over the same period, average room rates grew from €72 to €95. During the peak summer months of 2017, Galway hotels had a vacancy rate of only 5%. Savills found that compared to other cities, Galway has seen fewer hotel transactions. However, the recent sale of the 261 bedroom Radisson Blu Hotel for approximately €50m to MHL Hotels is a strong indicator of the demand for properties in the city, according to the firm. Currently underway in Galway is the extension of the Park House, which will add 15 rooms in an adjacent block in early 2018. Meanwhile, 10 hotels are currently in various stages of the planning process, with the development of new builds and extensions in the pipeline. According to Savills, the majority of the proposed development is planned from 2020, with very little due for delivery before then. Unlike previous years, hotel development will be focused in the city versus out of town locations. 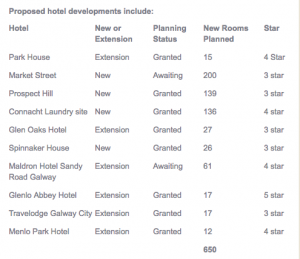 There are 3,218 rooms in Galway City as of 2017 and, if all proposed hotel projects are completed, the hotel bedroom supply in the Galway market will increase by 20%. "Development finance remains difficult to secure, coupled with strong build cost price inflation. However, the aspiration for new hotel development in Galway remains strong – and with good reason. Galway has traditionally enjoyed many high season events – such as the Galway Races, Arts Week etc. but current occupancy levels indicate demand is becoming less seasonal."